Tis the season...for collaborations! We're starting things off with a collaboration from Alesmith Brewing and Stone Brewing, two of San Diego's OG hop factories. The beer is Gregarious Nature IPA, a hoppy, easy drinker with notes of citrus and pine. The gentlemen start off with a grievance on holiday party menus and all the weirdo food preferences people have. Greg also talks about the annoyances of planning a wedding and his delightful trip to Arrow Lodge Brewing. Dan reviews a ... Más informaciones movie, just in time for the holiday season: The Possession of Hanna Grace. 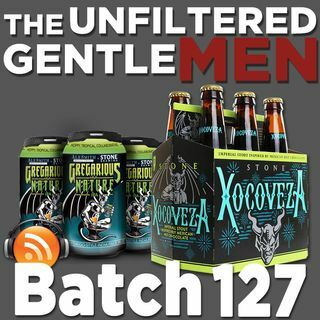 Our Bullpen Beer helps to officially ring in Christmas, Stone Brewing's Xocoveza Mocha Stout. Need some drinking games to get you through this time of year? We've got you covered with some festive drinking competitions. We also have 10 beers you need to survive the holidays. And we drop the Yule Log to ring in Christmas. In Booze News: Deschutes has to delay their Virginia project, Founders to brew in Colorado, Tesla drivers are using autopilot to get drunk, San Francisco Beer Week, and more! Our Beer Babe of the Week is May, make sure and follow her on Instagram @beerrookie! Old Timey Word of the Week: "Lady Abbess”. Use it in a sentence on social medias for a shout out!